Growing retail & hospitality sectors, construction & expansion of airports & metros, establishment of SEZs & commercial hubs and building new housing societies have fueled the market for air conditioners in India. Growth in the construction market and increasing government spending towards public infrastructures have further spurred the market. Though the prices of air conditioners are increasing in India but companies are offering various kind of schemes such as EMI and seasonal discounts which are highly attracting middle class population of the country. According to 6Wresearch, India air conditioner market is projected to grow at a CAGR of 10.2% during 2015-2021. India air conditioner market is high competitive and fragmented market with presence of domestic, international and unorganized market participants. In 2014, room air conditioner market accounted for major revenue share followed by central air conditioning systems. In room air conditioner segment, split air conditioner market dominates and would continue to lead through the forecast period. The demand for these air conditioners are primarily growing residential market. The report thoroughly covers the market by air conditioner types, application, and regions. The report provides unbiased and detail analysis of the on-going trends, opportunities/high growth areas, market drivers, which would help stakeholders to device and align market strategies according to the current and future market dynamics. •	Historical & Forecast data of Global Air Conditioner Market for the Period 2010-2021F. •	Historical & Forecast data of India Air Conditioner Market Revenue for the Period 2010-2021F. •	Historical & Forecast data of India Window AC Market Revenue & Volume for the Period 2010-2021F. •	Historical & Forecast data of India Split AC Market Revenue & Volume for the Period 2010-2021F. •	Historical & Forecast data of India Floor Standing AC Market Revenue & Volume for the Period 2010-2021F. •	Historical & Forecast data of India Cassette AC Market Revenue & Volume for the Period 2010-2021F. •	Historical & Forecast data of India Central AC Market Revenue for the Period 2010-2021F. •	Historical & Forecast data of India Central AC Market Revenue, By Types for the Period 2010-2021F. •	Historical & Forecast data of India Centralized AC Market Revenue for the Period 2010-2021F. •	Historical & Forecast data of India Centralized AC Market Revenue, By Components for the Period 2010-2021F. •	Historical & Forecast data of India Packaged AC Market Revenue & Volume for the Period 2010-2021F. •	Historical & Forecast data of India Ducted Split AC Market Revenue & Volume for the Period 2010-2021F. 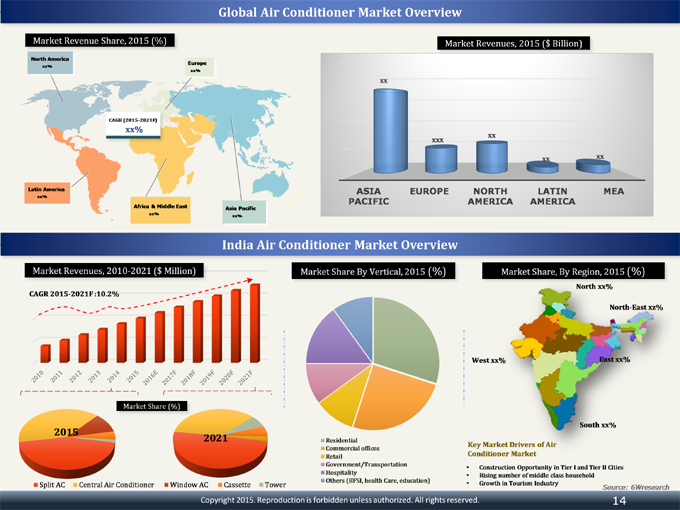 •	Historical & Forecast data of India Air Conditioner Application Market Revenue for the period 2010-2021F. •	Historical data of India Air Conditioner Regional Market Revenue for the Period 2010-2014. •	Market Size & Forecast of India Air Conditioner Regional Market Revenue until 2021F. 20.3	Daikin Airconditioning India Pvt. Ltd.
20.6	LG Electronics India Pvt. Ltd.
20.8	Panasonic India Pvt. Ltd.
India Air Conditioner Market is projected to grow at a CAGR of 10.2% through 2021 on account of growing construction market, infrastructure development, rising retail and hospitality industry and surging investing in residential & commercial sectors. India Air conditioner market report has been segmented into equipment types, end user applications and regions. The major companies in India's air conditioner market include – Blue Star Limited, Daikin Airconditioning India Pvt. Ltd., O General, LG, Voltas, Samsung, Hitachi, Videocon, Carrier and Panasonic.